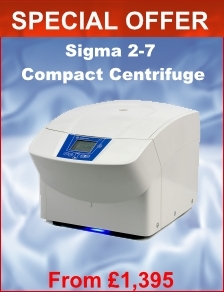 Sigma Centrifuges produce a complete range of both standard and refrigerated brushless microfuges and centrifuges that include models such as SIGMA 1-14 Microfuge, SIGMA 1-14K Microfuge, SIGMA 1-15 Microfuge, SIGMA 1-15K Microfuge, SIGMA 2-6 Centrifuge, SIGMA 1-6 Centrifuge, SIGMA 2-16 Centrifuge, SIGMA 2-16K Centrifuge, SIGMA 3-16 Centrifuge, SIGMA 2-16KCH Centrifuge, SIGMA 3-16 Centrifuge, SIGMA 3-16K Centrifuge, SIGMA 3-18 Centrifuge, SIGMA 3-18K Centrifuge, SIGMA 3-18KH Centrifuge, SIGMA 3K30 Centrifuge, SIGMA 4-16 Centrifuge, SIGMA 4-16K Centrifuge, SIGMA 4-16KH Centrifuge, SIGMA 6-16 Centrifuge, SIGMA 6-16K Centrifuge, SIGMA 6-16H-6-16KH Centrifuge, SIGMA 8K Centrifuge. 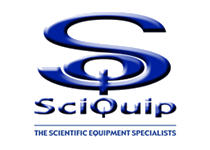 SciQuip supplies lab equipment throughout the UK and Ireland. 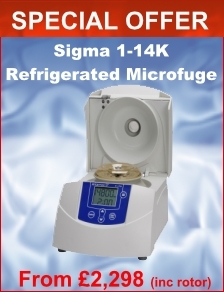 SciQuip’s laboratory equipment includes centrifuges, microfuges, freeze dryers, incubators, pipettes, vortex mixers and water baths. 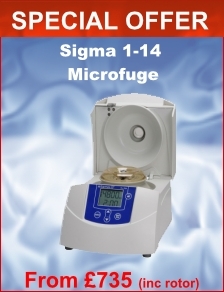 If you are unable to find the scientific or laboratory equipment you are looking for please do not hesitate to contact: SciQuip Technical Sales Support on 01939 234222 or contact us by email.